Profiling a prolific writer: Wilfredo O. Pascual, Jr.
Wilfredo O. Pascual, Jr. (USHS '84), epitomizes a humble, dedicated young person with boundless energy and creative talent who made writing the hallmark of his career. His efforts was amply rewarded when he won the much coveted Grand Prize Award of the prestigious Carlos Palanca Memorial Awards for Literature, 2004. Apart from his award-winning essay entitled ''Devotion'' which depicted a fan's extreme fondness and affection for his movie idol, he has to his credit two publications. One is ''Guns'' Father Poems edited by Alfred Yuson and Gemino Abad. This was published and distributed by Anvil Publishing, Manila, Philippines in 2004. The other is ''Return to the Great Books:'', SPAFA Journal, published by the Southeast Asian Regional Center for Archaeology and Fine Arts, Bangkok, Thailand in 2003. He was chosen a Work Study Scholar for creative non-fiction, Breadloaf Writers' Conference in the United States of America in 2003. In 2002, he was a participant in New York University Creative Writing Program. Aside from this accolade, Pascual has more to make him deserving of his present position which he hold for a decade now, as Publications Officer of the Southeast Asian Ministers of Education Organization (SEAMEO) based in Bangkok, Thailand. Among his accomplishments with his stint in SEAMEO are: Editor of SEAMEO's publications which publishes the Journal of Southeast Asian Education. He also attended since 1994 the Annual Ministerial Meeting of the Ministers and Secretary of Education of Southeast Asia. He presented his papers on the Guidelines and Standards on Teaching in ICT in Beijing, China in 2003 and Bridging the Digital Divide in Southeast Asia in Chennai, India in 2002. He represented the Organization at the World Education Market in Vancouver, Canada in 1999. An accomplished writer, he has an extensive experience applying strong research, writing, publishing and other presentation skills using traditional and non-traditional media in promoting the mandate, goal, and advocacy concerns of inter-governmental, non-government organizations and other groups. 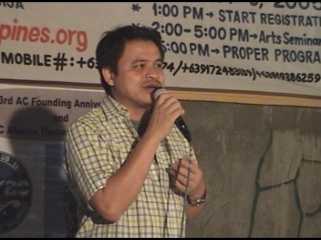 In his home country, he was Project Director of the Nueva Ecija Historical, Cultural and Arts Council in 1993; Field Officer, Orient Integrated Development Consultants, Inc., Bagiuo City from 1991-1992; and Liaison Officer, Coordinating Center for Dramatic Arts, Cultural Center of the Philippines, Manila in 1990. Pascual was also bestowed the ''Most Outstanding Son of San Jose City'' in 2004; Natatanging Novo Ecijano sa Pagsusulat Award by the College of Arts and Sciences in 1991; ''Journalism Awardee'' of the University Science High School in 1984; and named ''Most Creative Writer of the Year'' by the St. Joseph School, San Jose City. Already, Pascual has achieved local, national, and international prominence. The CLSU family believes that there will be more challenges and success to come. As his achievement rises, so does the image of his Alma Mater.